What are Solventless Concentrates and Rosin? WITH OVER 50,000 COMMERCIAL USES FOR THE VARIOUS PARTS OF THE CANNABIS PLANT KNOWN TO MAN THUS FAR, INDUSTRY LEADERS ARE WORKING TIRELESSLY TO FURTHER RESEARCH AND DEVELOP NEW TECHNOLOGIES TO KEEP PUSHING THE CANNABIS FORWARD. 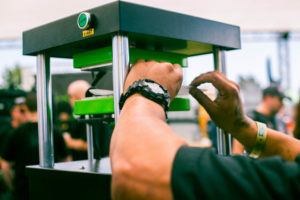 Rosin tech and solventless extraction is a new technology that empowers consumers to take control of their own extraction process. The technique is a relatively new way to transform the plant and by utilizing heat and pressure, it is an all natural way for consumers to make their own cannabis oil. Simply put, take your flower or hash, put it in a filter bag and in between parchment paper, then apply heat of ~215F and at least 500 PSI of pressure for 60 seconds, and that’s it – you’ve created a completely solventless cannabis extract. 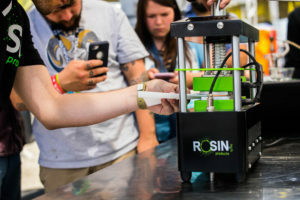 The term “rosin” stems from the method of making a product used to lubricate the bows of a violin, with cannabis connoisseurs putting their own spin on the solventless technique, which means that when it comes to pressing rosin, no foreign or additional substances need to be added to get the desired result. Rosin comes in a variety of forms, such as shatters, waxes and all different types of viscosities. The technology behind rosin, which is made from bubble hash, kief, trim or flower during an extraction process combining heat and pressure, ensures that the cannabis terpenes and cannabinoids are preserved. As a result, rosin holds a massive benefit in that consumers can know exactly what they are putting in their body following the extraction process. Because of this, making your own cannabis oil using the rosin technique is the best way to know what you are putting in your body and therefore, allows users to consume safely, all without compromising quality or altering the chemical make-up of the end product. Rosin tech is now the preferred method for at-home extraction, and when you consider the importance of knowing where your medicine is coming from its no surprise. Whether you get your flower from a neighbor who grows or are growing your own, there is a priceless peace of mind that comes with knowing exactly what you are consuming and where it came from, with making your own cannabis oil and using the rosin tech the best way to ensure exactly that. Additionally, it is also a method used by professional extractors looking to create a cannabis concentrate of the highest quality. While it is not the most time effective method for mass production, rosin is the clear winner when it comes to terpene and cannabinoid retention. Making rosin properly involves minimal risk, in turn, making it a favorable, fast-rising technology that shines in its brilliant simplicity and leaves consumers without worry that their high or health will be impacted. Other methods for making extracts require solvents, such as ethanol, propane (CO2) or butane, with the process of making butane hash oil (BHO) one of the most popular. When making extracts using solvents, the product has to be vacuum purged in order to be consumed safely, with the process sometimes taking days to execute and occasionally resulting in a residual solvent being left behind, changing the taste, flavor and quality of the concentrate. When you add a chemical to the extraction process, you are altering the chemical make-up of the oil, the effects of which have yet to be fully studied and could be potentially harmful, especially to those who are concerned with health issues. Of the many benefits of rosin, one major aspect is that it has incredible lab results., Data on rosin is still limited, but a recent High Times finding saw BHO averaging 75% THC content and other non-solvent hashes (bubble or dry-sift) averaged at 69%, with rosin clocking in at 76%. From allowing the at-home creation of pure, safe meds to the process being less expensive, quicker and simpler to execute than other extraction methods, rosin tech succeeds in offering a higher potency, terpene retention, while also creating versatile, solventless cannabis products, ready for worry-free consumption in a matter of minutes. It doesn’t come as a surprise that rosin is quickly emerging in popularity in the cannabis industry. Both for the retail dispensary market and for at home consumers, rosin is on the rise.